Wild2Be designed a perfect gift set that is as reliably tough as it is nice to look at. Whether for the outdoorsman who treks to the far ends of the earth, the weekend camper, or someone who simply spends a lot of time outside, gear is not only handy - it's essential. 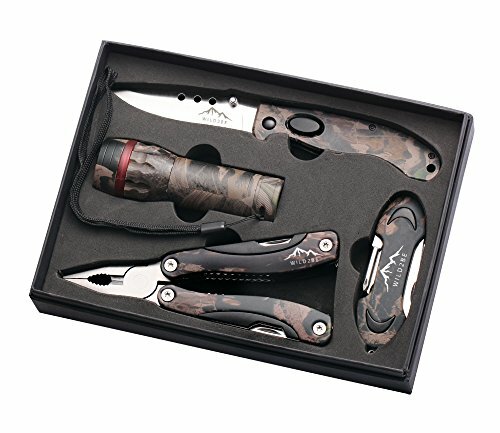 With versatility for Hunting, Fishing, Camping, Hiking, or curiosity-driven exploration, this gift set is perfect for any adventure. Wild2be designs feature versatile outdoor gear for everyone who consider life an adventure. Since our founding, we are committed to creating durable distinctive products in order to provide a freedom to experience life to the fullest. Enjoy the Wilderness! Happy and Wild Holidays from Wild2Be!!! KNIFE: Stainless steel blade with jimping, Aluminum handle with Pocket clip. 8 inches open, 4.5 inches folded. FLASHLIGHT: Super bright LED flashlight, with zoom and flash mode. Powered by 3xAAA batteries (not included). MULTI-TOOL Pliers: Heavy duty multi-tool Pliers, 6 inches open, 4 inches closed, contains Pliers with Wire cutter, Can and Bottle opener, Medium flat screwdriver, Leather punch, Large flat screwdriver with single and double file, Serrated knife, Small flat screwdriver, Phillips head screwdriver, Knife. MULTI-FUNCTION 7-in-1 FOLDING KNIFE: Compact, 3.5 inches when folded, can be used as keychain. Contains Knife, Can opener, Bottle opener, Scissors, Phillips head screwdriver, Leather punch, Corkscrew. If you have any questions about this product by Wild2Be, contact us by completing and submitting the form below. If you are looking for a specif part number, please include it with your message.